It’s such a depressingly familiar pattern; a beautiful old house with grounds, falls into a state of neglect and is then bought by a developer. With absolutely no incentive to maintain the house it slowly slips into a downward spiral of decay and vandalism until the inevitable request for demolition is presented to the council. And it’s happening again. Brook House in Tiptree, Essex is a classic, grade-II listed, red-brick Georgian village house lacked an owner after the last member of the family died and now after being owned by a developer it has unsurprisingly reached a rather sad state. The developer might be disappointed that no-one has yet burnt it down but nonetheless he had requested permission to demolish and replace it with several new houses saying that the house is beyond repair – all backed up by a survey which was commissioned by…the developer! What’s perhaps worse is that English Heritage have also sided with the developer and agreed. I despair. What is the point of EH if they fail to stand up when buildings are threatened like this? Anyway, if you live within the area, please contact Colchester Council and ask them to not only refuse this vandalism but also to serve an enforcement notice to repair this lovely part of Tiptree’s heritage. 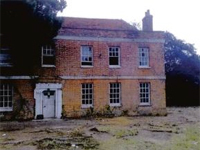 This entry was posted in At Risk, Comment, News and tagged brook house, buildings at risk, country house, demolition, essex, grade-ii, listed. Bookmark the permalink. Thanks – I’ve just added another post to highlight the latest twists. Please do let me know if you hear any more and I’ll add it here. Anyone know about the family who lived there called Hull, as I believe they are ancestors of ours. Would love to know more about them and the history. You say that the developer would be disappointed that the house had not burned down. Coincidentally, a fire did break out shortly after he had taken ownership, but a neighbour called the fire brigade and it was put out before it could take hold. I drove past this house two days ago and I was shocked to see that it is now half collapsed. I lobied Colchester Council and my local MP and contacted the Georgian Society, but it seems that this developer, as usual, will get his way.